Novalis NovaCore Waterproof Multilayer Flooring Review | Floors, Flooring, Carpet and More! Novalis Innovative Flooring has introduced a new collection of Multilayer Flooring called NovaCore. Novalis HPC is engineered from bottom to top to be a really incredible floor and not like any floor you’ve seen in traditional luxury vinyl flooring. This is not traditional luxury vinyl flooring that is flexible and utilizes licensed technology from Unilin and USFloors to making a very rigid, waterproof core Multilayer Flooring product that can withstand heavy traffic and remain beautiful over the long haul. American Carpet Wholesalers of Georgia carries the NovaCore product, like Williamsburg (shown at left). Two types are available – normal width and extra large plank styles. To be sure, NovaCore is a gorgeous Multilayer Flooring option, joining trendsetting Novalis decor design with its innovative solid core engineering. So, what exactly is NovaCore? 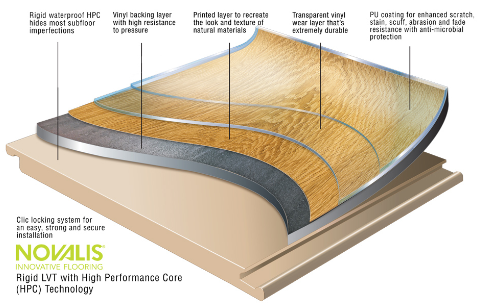 Novalis says that NovaCore is an HPC Multilayer Flooring product. The anacronym HPC stands for High-Pressure Core. The product does not contain any wood so don’t confuse it with a WPC or Wood Particle Composite. It could, technically speaking, be considered an EVP or Engineered Vinyl Plank, but the more common term is Multilayer Flooring. The NovaCore product has a multilayer construction with a waterproof core making the flooring ideal for use in all areas of the home! You can enjoy the look and feel of wood flooring in bathrooms, kitchens, laundry rooms or mud rooms without the worry of damaging expensive true hardwood or warping and buckling that can occur with many laminate engineered plank products. Both the regular NovaCore and NovaCore extra large plank products have a lifetime limited residential warranty and a 10 year limited light commercial warranty. NovaCore is, in general, easier to cut and install than other plank products. When installing you need to make sure the substrate is flat. Too much waviness will cause a failure of the locking mechanism. The forgiveness in this product is that due to its rigidity, small cracks and pockmarks, gaps in wood panels, or embossings in sheet vinyl will not show through as easily, so prep will be minimal. That being said it is always a good idea to consult with a professional installer before undertaking a flooring renovation project. To see the entire line of NovaCore Multilayer Flooring products available at American Carpet Wholesalers of Georgia, simply click here. The Williamsburg, Apple Caramel, and Weathered Oak Bungalow (shown at right) are just a few of the eight regular width planks available. The extra large planks measure 8 and 3/4 inches wide (!!!) and just under 60 inches long. 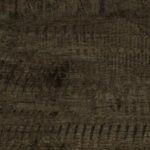 European Oak Lorimer is a beautiful, dark, rich wood pattern plank but there are seven additional styles in the extra long plank collection. Crescent Heart Pine Honey, Crescent Heart Pine Sandle, Old World Oak Chocolate, Old World Oak Smoke, Refined Birch Cognac, Refined Walnut Ellis, and Refined Walnut Waverly. When you call and speak with our flooring experts you can ensure two things will happen. That you will get the best advice and the best price on any Multilayer Flooring product. Talk to an ACWG flooring expert at 1-800-548-2706. Monday through Friday from 8:30 to 7 or Saturdays from 9 to 4. 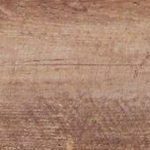 Click here for more reviews of the Luxury Vinyl Plank products available at American Carpet Wholesalers or Click here to explore other styles of flooring. For more on American Carpet Wholesalers check out the customer submitted reviews on Reseller Ratings.